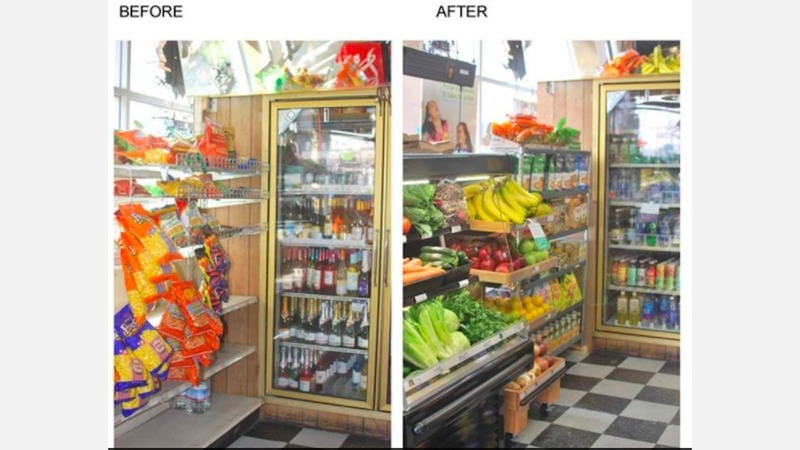 A community-led effort to bring healthier foods to the Tenderloin plans to convert a sixth corner store this summer. The Tenderloin Healthy Corner Store Coalition started in 2012 through a grant provided to the Vietnamese Youth Development Center. Youth involved with the grant launched an initiative to reduce the number of stores in District 6 that offer unhealthy products like low-nutrient food, cigarettes, and alcohol. Their survey found more than 42 percent of the area's 46 corner stores lacked any fresh fruit or vegetables. 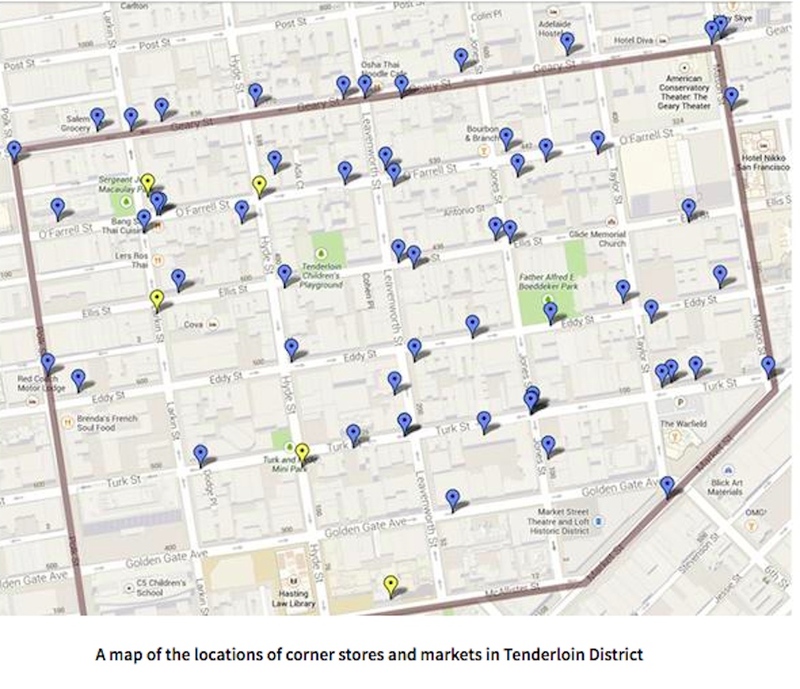 A map of Tenderloin corner stores and markets. 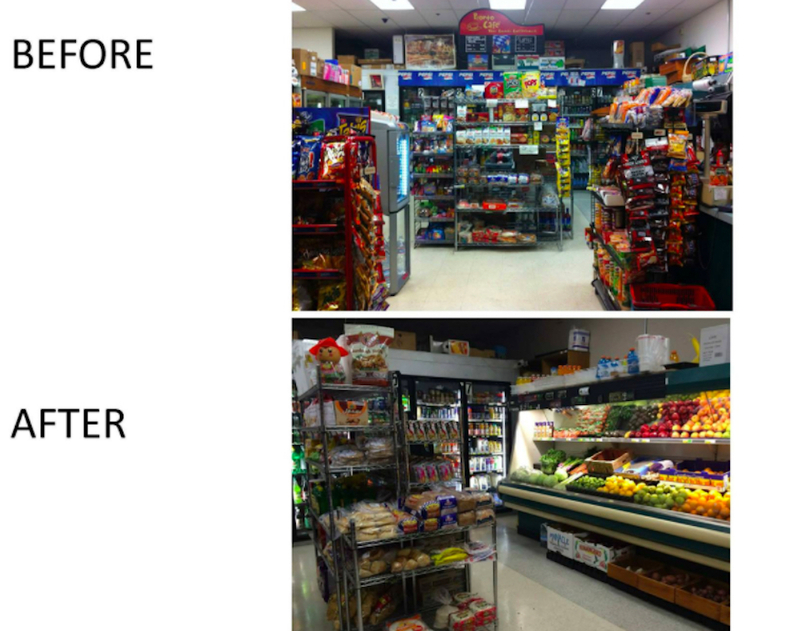 Initial efforts helped five corner stores change their inventory to offer healthier options, program manager Shelley Dyer told us. Dyer is with the Tenderloin Neighborhood Development Corporation, which partnered with city agencies like Healthy Retail SF and the mayor's office to support corner store conversions and hire part-time staff who build and maintain relationships with store owners. As of this year, the coalition is a program of TNDC, Dyer said. It has worked with community members to select a sixth corner store for conversion in summer 2018, with a final selection slated for later this month. Before and after photos of Radman's Produce Market on Turk Street. Community members chose a store that has few healthy options and a high level of "less positive activity" going on just outside its doors, she said. The store must be evaluated by the program's grocery consultant to determine what support is needed for conversion, and whether it has a high likelihood of success once it starts offering healthier options. The program's part-time staff visits coalition-supported stores to ensure that produce and healthy food options are affordable and high-quality. The last store to receive conversion support was Dalda's at the corner of Eddy and Turk streets. Over two years, the coalition and its partners embarked on a full store redesign that expanded its produce section, moved unhealthy products above eye level, and added signage to promote healthy options. The project was the first time the program supported a full store reset, she said. Radman's Produce Market, 201 Turk St.
Amigo's Market, 500 Ellis St. Mid City Market, 868 Geary St.
Fox Market, 570 Larkin St. Improvements tend to include the addition of dry produce and bulk food bins, new lighting, removing tobacco ads, and creating more prominent displays for healthy options, Dyer said. The coalition meets at 220 Golden Gate Avenue on the fourth Thursday of each month from 3-4pm, with this month's meeting scheduled for March 22nd. Tenderloin residents are also encouraged to join the steering committee meetings on the third Wednesday of each month from 1-2pm, also held at 220 Golden Gate Ave.